Does forgetting about turning off your fire pit seem to be a problem? Well, now you don't ever have to forget to turn the gas off again, courtesy of Hearth Products Controls. This automatic stainless steel commercial grade gas shut-off will do the deed for you. The minimum length is 15 minutes, and the maximum is 2 hours. 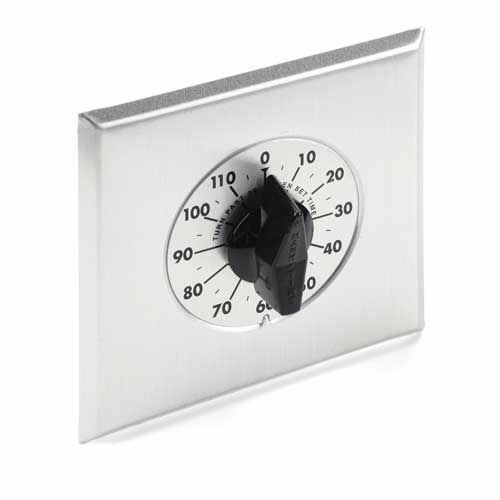 The durable stainless steel rotary timer is strong enough for outdoor use, and its compact 2.5" depth design and sleek stainless steel finish allow it to be installed almost anywhere. Product is for use with a separately-purchased NEMA 3-R enclosure. Can this timer be used for an indoor gas stove? No, this timer is meant for use only with with a separately-purchased NEMA 3R enclosure. How does this product shut the gas off? Is there another gas valve that is required? This timer is designed for use with 110 volt or millivolt gas valves. The timer functions as an in line switch and will cut power to the valve at the indicated time. The power lead from the gas valve must be run to the timer and attached to one of the "line" terminals. The supply wire back to the valve is then attached to the corresponding "load" terminal on the switch. When the timer turns off, the circuit is interrupted and the gas valve will shut down.